According to the World Oral Health Report, despite great improvements in oral health in several countries, oral health problems still persist, particularly among underprivileged groups in both developing and developed countries. Dental caries and periodontal diseases are identified as the most important among oral health problems globally. Oral diseases adversely affect the general health too. Quality of life and the working capacity of an individual are also affected. The antibacterial agents that are currently used for treatment of oral health problems are reported to cause several side effects such as diarrhea, vomiting, etc., Increasing bacterial resistance to the drugs is also a major concern. Because of the adverse effects, increasing bacterial resistance, and high cost associated with the standard therapeutic procedure, there is a need to explore new therapeutic agents and conduct further clinical research on traditional medicines obtained from various plant sources. Many traditionally used medicines for treating infections have been studied again, and clinical trials are being done to establish their efficacy and possible side effects. One of these natural medicines is essential oils (EOs)., In the recent years, there has been an increased interest toward EOs. The purpose of this systematic review is to analyze the published data related to the EOs. A number of studies have been conducted to prove the therapeutic properties of various EOs, but very few reviews have been published on their implication in dental treatment. The review gives an overview on the EOs, their therapeutic properties, and adverse effects. To identify relevant literature, an electronic search was performed on PubMed database. Titles and abstracts were screened. Only articles related to lavender oil, eucalyptus oil, clove oil, cinnamon oil, and lemon EOs have been included in this review. Studies related to several other EOs were excluded. Total 52 articles found relevant were selected for this review. The mechanisms of action of EOs are dependent on their chemical composition and the location of one or more functional groups on the molecules present in them. Membrane damage is proposed to be the main mechanism of action. Solubility of EOs in the phospholipid bilayer of cell membranes seems to have an important role in their antimicrobial activity. Clove oil has reported to reduce the quantity of ergosterol which is found specifically in fungal cell membrane. Terpenoids in EOs have been found to interfere with the enzymatic reactions of energy metabolism. Essential oils that have potential to be used in oral disease prevention and treatment are discussed subsequently. Major components found are linalool, linalyl acetate, 1,8-cineole, B-ocimene, terpinen-4-ol, l-fenchone, camphor, and viridiflorol., However, the relative level of each of these constituents varies in different species. Lavender oil, obtained from the flowers of Lavandula angustifolia (Family: Lamiaceae) by steam distillation, is chiefly composed of linalyl acetate (3,7-dimethyl-1,6-octadien-3yl acetate), linalool (3,7-dimethylocta-1,6-dien-3-ol), lavandulol, 1,8-cineole, lavandulyl acetate, and camphor. The activity of linalool reflects that of the whole oil, indicating that linalool may be the active component of lavender oil. Antifungal: EOs of Lavandula luisieri show an inhibitory effect on yeast, dermatophyte, and Aspergillus strains.Lavandula viridis is reported to have fungicidal effect. Cryptococcus neoformans is the most sensitive fungus, followed by Candida species. The main component is 1,8-cineole followed by cryptone, α-pinene, p-cymene, α-terpineol, trans-pinocarveol, phellandral, cuminal, globulol, limonene, aromadendrene, spathulenol, and terpinene-4-ol. Anti-inflammatory effect: Immunoregulatory agent: The study of Serafino et al. demonstrates that eucalyptus EO can stimulate the innate cell-mediated immune response suggesting its use as adjuvant in immunosuppression, in infectious disease, as well as in tumor chemotherapy. Peppermint (Mentha piperita) oil is one of the most popular and widely used EOs. In the EO from M. piperita, menthol is identified as the major compound, followed by menthyl acetate and menthofuran. Antibiofilm: Biofilm inhibition in fungal strains helps to decrease pathogenesis and drug resistance. Studies show that EO inhibits the biofilm formation of Candida albicans completely up to 2 μl/ml in a dose-dependent manner. It is also known as Tea Tree Oil (TTO). Its composition shows terpinen-4-ol, γ-terpinene, p-cymene, α-terpinene, 1,8-cineole, α-terpineol, and α-pinene. Antifungal activity: Melaleuca alternifolia possesses antimycotic activity, terpinen-4-ol being its most effective component. Mostly, it contains almost exclusively terpenes and oxygenated terpenes. Eugenol is well-known for its therapeutic properties and is widely used in dentistry. • Antibacterial: It was found to possess inhibitory effect on multi-resistant Staphylococcus spp. The volatile oils obtained from the bark, leaf, and root barks vary significantly in chemical composition. Three of the main components of the EOs obtained from the bark of Cinnamomum zeylanicum are trans-cinnamaldehyde, eugenol, and linalool, which represent 82.5% of the total composition. Cinnamaldehyde is the major constituent of cinnamon EO, and studies show that it is the most active component too. Antimicrobial effect: Inhibitory effect on the growth of various isolates of bacteria including Gram-positive, Gram-negative, and fungi. Antimutagenic: It has antimutagenic potential against spontaneous mutations in human cells. Furthermore, the study of Cabello et al. performed in animals shows that oral administration of cinnamaldehyde (CA) exerts significant anti-melanoma activity. Besides these activities, studies suggest that cinnamomum zeylanicum (CZ) has antiparasitic, antioxidant, and free radical scavenging properties. Potential implications of EOs have been described below and the information is consolidated in [Table 1]. It can be used in dental clinics to reduce patients' anxiety. It is found to be useful as an anxiolytic agent when used in waiting area., The study performed by Zabirunnisa showed statistically significant reduction in anxiety scores when the fragrance of lavender oil was used at the reception area. It is also helpful during surgical procedures, as it has been shown to reduce the pain of needle insertion. It shows an inhibitory effect on oral pathogens like Lactobacillus acidophilus, which makes this suitable to be used as an anticariogenic agent. Eugenol oil is used widely in dentistry. It is active against oral pathogens associated with dental caries and periodontal disease. Studies done on five EOs (TTO, lavender oil, thyme oil, peppermint oil, and eugenol oil) against four common oral pathogens (S. aureus, Enterococcus faecalis, E. coli, and C. albicans) showed significant inhibitory effect of eugenol oil, peppermint oil, and TTO. Among them, eugenol oil showed antimicrobial activity at the lowest concentration level. TTO and some of its individual components, specifically terpinen-4-ol, exhibit strong antimicrobial efficacy against fungal biofilms. TTO can be a solution for the increasing resistance of C. albicans to established antifungal drugs. It can be used to treat oral candidiasis  and is suitable for use in prophylactic oral hygiene products. The study performed by Ramage et al. shows that it is more appropriate and safe to use terpinen-4-ol, the major component of TTO, than TTO itself. A Phase I clinical trial conducted on cinnamon EO concluded that it is safe to be used in healthy patients with dentures for the treatment of oral candidiasis. Lemon EO is suggested to be used as an effective remedy against candidiasis caused by C. albicans. Combining EOs and antibiotics can reduce antibiotic resistance in multidrug-resistant bacteria. Peppermint, cinnamon bark, and lavender EOs were found to be antibiotic resistance-modifying agents, when used in combination with piperacillin. Several studies support the benefits of EOs, but some studies raise questions about their efficacy. A study in which 0.2% chlorhexidine rinse and an EO mouth rinse were compared for their efficacy showed that EOs are effective only for very short duration, i.e., 2–3 h, and concluded that use of chlorhexidine is preferable over EOs. A study done on EOs to measure their efficacy when used as a coolant concluded that there was no benefit over water during ultrasonic root debridement for the treatment of chronic periodontitis. Natural medicines are not always free of side effects. Adverse effects are also reported with EOs. In the study of Millet et al., commercial preparations of essences of sage, hyssop, thuja, and cedar have been reported to cause neurotoxicity and human intoxication, of which tonic–clonic convulsions formed the major symptom. According to a review by Posadzki et al., mild to severe adverse effects including fatality can be caused by EOs like lavender, peppermint, TTO, and ylang-ylang when used in aromatherapy. Most common adverse effect among them was dermatitis. Toxicological tests are often lacking for traditional medicines. Therefore, further clinical trials are required to exclude the possibility of side effect and poisoning. Only seven EOs that are found to be used commonly are included in this review. The review is subjected to publication bias as it is written on the basis of published literature. Only English language articles were referred. Article search was performed only in one database, PubMed. As described in this review, there is considerable evidence that EOs have potential to be developed as preventive or therapeutic agents for various oral diseases. Although several other potential uses of EOs have been described  and many claims of therapeutic efficacy have been validated adequately by either in vitro testing or in vivo clinical trials, still there is need for conducting further research to establish the safety and efficacy of these EOs before including them in clinical practice. If used properly, they may prove very useful in dental therapy and may contribute in improving the quality of dental treatments. In particular, clinical trials that confirm the therapeutic potential of EOs in vivo and address issues such as adverse effects, toxicity, and their interaction with other drug molecules would be of great value. Petersen PE. The World Oral Health Report 2003: Continuous improvement of oral health in the 21st century-the approach of the WHO Global Oral Health Programme. Community Dent Oral Epidemiol 2003;31(Suppl 1):3-23. Palombo EA. Traditional medicinal plant extracts and natural products with activity against oral bacteria: Potential application in the prevention and treatment of oral diseases. Evid Based Complement Alternat Med 2011;2011:680354. Kalemba D, Kunicka A. Antibacterial and antifungal properties of essential oils. Curr Med Chem 2003;10:813-29. Thosar N, Basak S, Bahadure RN, Rajurkar M. Antimicrobial efficacy of five essential oils against oral pathogens: An in vitro study. Eur J Dent 2013;7(Suppl 1):S71-7. Baratta MT, Dorman HJ, Deans SG, Figueiredo AC, Barroso JG, Ruberto G. Antimicrobial and antioxidant properties of some commercial essential oils. Flavour Fragr J 1998;13:235-44. Guleria S, Tiku AK, Koul A, Gupta S, Singh G, Razdan VK. Antioxidant and antimicrobial properties of the essential oil and extracts of Zanthoxylum alatum grown in north-western Himalaya. Scientific World Journal 2013;2013:790580. Rehman SU, Ahmad MM, Kazmi ZH, Raza MS. Physico-chemical variations in essential oils of Citrus reticulata. J Food Sci Technol 2007;44:353-6. Benabdelkader T, Zitouni A, Guitton Y, Jullien F, Maitre D, Casabianca H, et al. Essential oils from wild populations of Algerian Lavandula stoechas L.: Composition, chemical variability, and in vitro biological properties. Chem Biodivers 2011;8:937-53. Kiran CR, Chakka AK, Amma KP, Menon AN, Kumar MM, Venugopalan VV. Influence of cultivar and maturity at harvest on the essential oil composition, oleoresin and -gingerol contents in fresh ginger from northeast India. J Agric Food Chem 2013;61:4145-54. Prashar A, Locke IC, Evans CS. Cytotoxicity of lavender oil and its major components to human skin cells. Cell Prolif 2004;37:221-9. Pinto E, Vale-Silva L, Cavaleiro C, Salgueiro L. Antifungal activity of the clove essential oil from Syzygium aromaticum on Candida, Aspergillus and dermatophyte species. J Med Microbiol 2009;58:1454-62. Knobloch K, Pauli A, Iberl B, Weis N, Weigand H. Antibacterial activity and antifungal properties of essential oil components. J Essent Oils Res 1988;1:119-28. Végh A, Bencsik T, Molnár P, Böszörményi A, Lemberkovics E, Kovács K, et al. Composition and antipseudomonal effect of essential oils isolated from different lavender species. Nat Prod Commun 2012;7:1393-6. Ait Said L, Zahlane K, Ghalbane I, El Messoussi S, Romane A, Cavaleiro C, et al. Chemical composition and antibacterial activity of Lavandula coronopifolia essential oil against antibiotic-resistant bacteria. Nat Prod Res 2015;29:582-5. Lehrner J, Marwinski G, Lehr S, Johren P, Deecke L. Ambient odors of orange and lavender reduce anxiety and improve mood in a dental office. Physiol Behav 2005;86:92-5. Kim S, Kim HJ, Yeo JS, Hong SJ, Lee JM, Jeon Y. The effect of lavender oil on stress, bispectral index values, and needle insertion pain in volunteers. J Altern Complement Med 2011;17:823-6. Bradley BF, Brown SL, Chu S, Lea RW. Effects of orally administered lavender essential oil on responses to anxiety-provoking film clips. Hum Psychopharmacol 2009;24:319-30. Zuzarte M, Gonçalves MJ, Cruz MT, Cavaleiro C, Canhoto J, Vaz S, et al. Lavandula luisieri essential oil as a source of antifungal drugs. Food Chem 2012;135:1505-10. Posadzki P, Alotaibi A, Ernst E. Adverse effects of aromatherapy: A systematic review of case reports and case series. Int J Risk Saf Med 2012;24:147-61. Bachir RG, Benali M. Antibacterial activity of the essential oils from the leaves of Eucalyptus globulus against Escherichia coli and Staphylococcus aureus. Asian Pac J Trop Biomed 2012;2:739-42. Yap PS, Lim SH, Hu CP, Yiap BC. Combination of essential oils and antibiotics reduce antibiotic resistance in plasmid-conferred multidrug resistant bacteria. Phytomedicine 2013;20:710-3. Saharkhiz MJ, Motamedi M, Zomorodian K, Pakshir K, Miri R, Hemyari K. Chemical composition, antifungal and antibiofilm activities of the essential oil of Mentha piperita L. ISRN Pharm 2012;2012:718645. Witkowska D, Sowinska J. The effectiveness of peppermint and thyme essential oil mist in reducing bacterial contamination in broiler houses. Poult Sci 2013;92:2834-43. Pereira TS, de Sant'anna JR, Silva EL, Pinheiro AL, de Castro-Prado MA.In vitro genotoxicity of Melaleuca alternifolia essential oil in human lymphocytes. J Ethnopharmacol 2014;151:852-7. Santamaria M Jr, Petermann KD, Vedovello SA, Degan V, Lucato A, Franzini CM. Antimicrobial effect of Melaleuca alternifolia dental gel in orthodontic patients. Am J Orthod Dentofacial Orthop 2014;145:198-202. Terzi V, Morcia C, Faccioli P, Valè G, Tacconi G, Malnati M.In vitro antifungal activity of the tea tree (Melaleuca alternifolia) essential oil and its major components against plant pathogens. Lett Appl Microbiol 2007;44:613-8. Białoń M, Krzyśko-Łupicka T, Koszałkowska M, Wieczorek PP. The influence of chemical composition of commercial lemon essential oils on the growth of Candida strains. Mycopathologia 2014;177:29-39. Chaieb K, Zmantar T, Ksouri R, Hajlaoui H, Mahdouani K, Abdelly C, et al. Antioxidant properties of the essential oil of Eugenia caryophyllata and its antifungal activity against a large number of clinical Candida species. Mycoses 2007;50:403-6. Chaieb K, Hajlaoui H, Zmantar T, Kahla-Nakbi AB, Rouabhia M, Mahdouani K, et al. The chemical composition and biological activity of clove essential oil, Eugenia caryophyllata (Syzigium aromaticum L. Myrtaceae): A short review. Phytother Res 2007;21:501-6. Naveed R, Hussain I, Tawab A, Tariq M, Rahman M, Hameed S, et al. Antimicrobial activity of the bioactive components of essential oils from Pakistani spices against Salmonella and other multi-drug resistant bacteria. BMC Complement Altern Med 2013;13:265. Ooi LS, Li Y, Kam SL, Wang H, Wong EY, Ooi VE. Antimicrobial activities of cinnamon oil and cinnamaldehyde from the Chinese medicinal herb Cinnamomum cassia Blume. Am J Chin Med 2006;34:511-22. King AA, Shaughnessy DT, Mure K, Leszczynska J, Ward WO, Umbach DM, et al. Antimutagenicity of cinnamaldehyde and vanillin in human cells: Global gene expression and possible role of DNA damage and repair. Mutat Res 2007;616:60-9. Oliveira Jde A, da Silva IC, Trindade LA, Lima EO, Carlo HL, Cavalcanti AL, et al. Safety and tolerability of essential oil from Cinnamomum zeylanicum blume leaves with action on oral candidosis and its effect on the physical properties of the acrylic resin. Evid Based Complement Alternat Med 2014;2014:325670. Ramage G, Milligan S, Lappin DF, Sherry L, Sweeney P, Williams C, et al. Antifungal, cytotoxic, and immunomodulatory properties of tea tree oil and its derivative components: Potential role in management of oral candidosis in cancer patients. Front Microbiol 2012;3:220. Ranasinghe P, Pigera S, Premakumara GA, Galappaththy P, Constantine GR, Katulanda P. Medicinal properties of 'true' cinnamon (Cinnamomum zeylanicum): A systematic review. BMC Complement Altern Med 2013;13:275. Elaissi A, Rouis Z, Salem NA, Mabrouk S, ben Salem Y, Salah KB, et al. Chemical composition of 8 eucalyptus species' essential oils and the evaluation of their antibacterial, antifungal and antiviral activities. BMC Complement Altern Med 2012;12:81. Ishnava KB, Chauhan JB, Barad MB. Anticariogenic and phytochemical evaluation of Eucalyptus globules Labill. Saudi J Biol Sci 2013;20:69-74. Cai L, Wu CD. Compounds from Syzygium aromaticum possessing growth inhibitory activity against oral pathogens. J Nat Prod 1996;59:987-90. Serafino A, Sinibaldi Vallebona P, Andreola F, Zonfrillo M, Mercuri L, Federici M, et al. Stimulatory effect of Eucalyptus essential oil on innate cell-mediated immune response. BMC Immunol 2008;9:17.
van de Braak SA, Leijten GC. Essential Oils and Oleoresins: A Survey in the Netherlands and Other Major Markets in the European Union. Rotterdam: CBI Centre for the Promotion of Imports from Developing Countries; 1994. p. 116. Jandourek A, Vaishampayan JK, Vazquez JA. Efficacy of melaleuca oral solution for the treatment of fluconazole refractory oral candidiasis in AIDS patients. AIDS 1998;12:1033-7. Cabello CM, Bair WB 3rd, Lamore SD, Ley S, Bause AS, Azimian S, et al. The cinnamon-derived Michael acceptor cinnamic aldehyde impairs melanoma cell proliferation, invasiveness, and tumor growth. Free Radic Biol Med 2009;46:220-31. Malhotra S, Yeltiwar RK. Evaluation of two mouth rinses in reduction of oral malodor using a spectrophotometric technique. J Indian Soc Periodontol 2011;15:250-4. Millet Y, Jouglard J, Steinmetz MD, Tognetti P, Joanny P, Arditti J. Toxicity of some essential plant oils. Clinical and experimental study. Clin Toxicol 1981;18:1485-98. 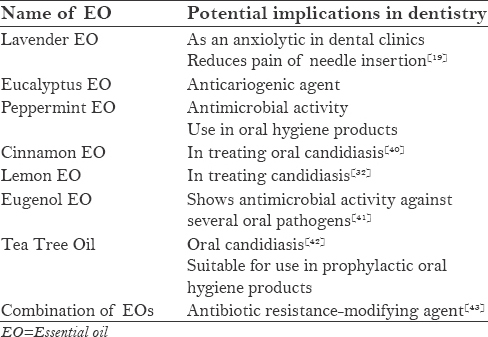 Dagli N, Dagli R. Possible use of essential oils in dentistry. J Int Oral Health 2014;6:i-ii.